This explosive new production of TENNESSEE WILLIAMS' Pulitzer Prize-winning classic features a dynamic cast led by Academy Award® nominee TERRENCE HOWARD, Tony Award® winners PHYLICIA RASHAD and ANIKA NONI ROSE, and Academy Award® nominee and two-time Tony winner JAMES EARL JONES. Renowned director and choreographer DEBBIE ALLEN directs. 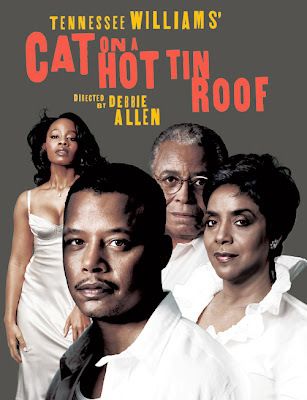 In CAT ON A HOT TIN ROOF, a powerful Southern family gathers at a birthday celebration for patriarch Big Daddy (Jones), who does not know that he is dying of cancer. In a scramble to secure their part of his estate, family members hide the truth about his diagnosis from him and Big Mama (Rashad). Front and center as tensions mount are alcoholic former football hero Brick (Howard) and his beautiful but sexually frustrated wife Maggie "the Cat" (Rose); as their troubled relationship comes to a stormy and steamy climax, a shockwave of secrets are finally revealed.